I am starting my first clinical blog from my new website about two of my favorite subjects; intraoral radiology and knowing the dentition of your patients. One of the first tasks when performing the unconscious examination of your patient, is to count teeth. Does your patient have all of the teeth expected for that species. Adult dogs should have 42 teeth and the adult cat should have 30. It is not unusual for certain breeds to have missing teeth. But, it is important to determine if the tooth is missing because this patient did not develop one, or is that tooth there but not visible to the eye? In other words, is there an impacted tooth where it appears to be missing? In this case, this dog was admitted for an ovariohysterectomy. The technician counted the teeth and informed the veterinarian that there was a tooth missing. A phone call was placed to the client informing her that there was a tooth missing and that an intraoral radiograph is recommended. When the client asked why this is important, it was explained that sometimes the tooth is there but impacted (trapped within the jaw bone) and impacted teeth can create dentigerous cysts. As a tooth is developing, there is a membrane of tissue that surrounds the developing enamel. In a normal situation, as the tooth continues to develop and erupt, that membrane tears and becomes other important structures. Sometimes teeth can become impacted. They can get trapped by other crowding teeth or they may develop in a direction incompatible with normal tooth eruption. When the tooth can not move through the gingiva and bone during the eruption process, that thin membrane never gets disrupted. Often, that membrane will begin to pull fluid into the sac and will begin to enlarge. As it enlarges, it puts pressure on the surrounding bone and it can destroy much in its wake. 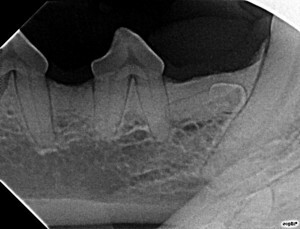 In this case, the right lower first premolar is impacted due to its abnormal positioning. 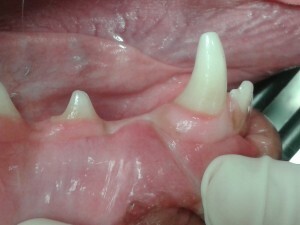 It is suggested that when these teeth are found, the recommendation for surgical extraction is made. This is a relatively brief and inexpensive procedure at this point. Left undiscovered and untreated, they can enlarge to a point where the jaw is at risk for pathological fracture, adjacent teeth can be exposed to tooth root resorption and very expensive and extensive to treat. The next image is from a 4 year old breeder male Boxer. 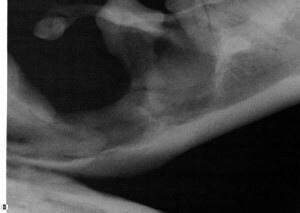 Since the dog had never been neutered, no one addressed the missing teeth. When the dog was adopted, he was admitted to be neutered. On pre-op physical examination, it was noted that there were missing teeth. The following is the amount of damage proliferated by the untreated dentigerous cyst from a simple impacted first premolar. How often will you see this problem? Well, for a frame of reference, I work clinically in a 7 veterinarian practice and we find on average 6 cases per year. I don’t see that many cases of distemper per year but we certainly protect against it anyway!